Gooey Butter Cake, once considered a St. Louis delicacy, is now becoming more and more common/popular across the country, thanks due to Paula Deen and her love of all things butter. But, let's be real, we in St. Louis will always cherish growing up with Gooey Butter Cake well before Paula Deen was a household name. 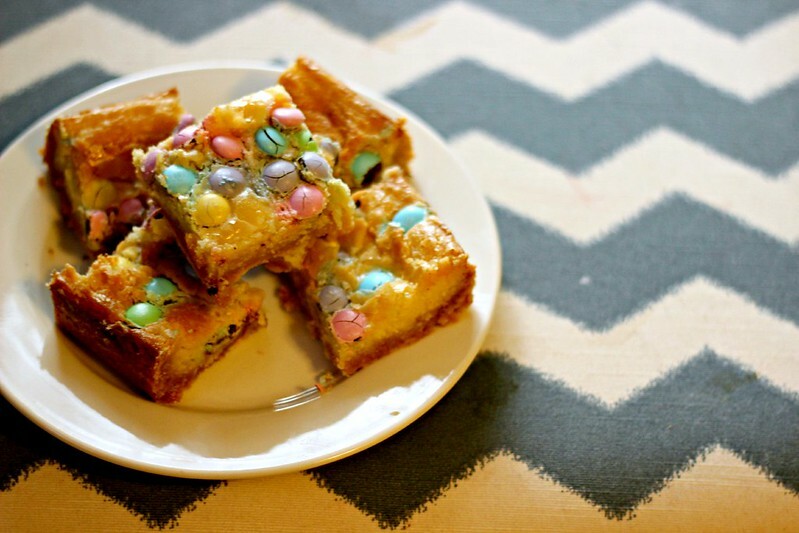 If you're unfamiliar, Gooey Butter Cake is kind of like a sweet and rich coffee cake, often cut in to squares similar to a brownie or blondie, with a distinct separation of a dense cake, and gooey cream cheese. In short, it's pure deliciousness! This recipe is not from scratch, but that's OK! I've tried plenty of from scratch versions and they're just not the same. Not bad, just not the same. I'm still trying to find a from scratch version though, so maybe one day! The best thing about this recipe is that you can make many variations. Use a chocolate cake mix and add mini chocolate chips to the topping. Try a spice cake and kind of make a cinnamon roll version (disclaimer: I have not tried this with a spice cake mix!). The possibilities are endless. Try one of these from the blog! Combine cake mix, one egg and 1 stick of melted butter with an electric mixer, Grease a 9 x 13 pan. Pat the mixture evenly in to the prepared baking pan. In a clean bowl, beat the cream cheese until smooth, then add the remaining two eggs, vanilla, and remaining stick of melted butter. Add powdered sugar and mix well. Spread the cream cheese mixture evenly over the cake mixture. Source: Many St. Louis homes growing up! The addition of M&Ms was all mine! These look amazing! Love the addition of the M&M's!